Trend Title:Trending Now: "Lifestyle Centers"
Info:The Village at Westfield Topanga is the California Experience! There is a new trend today called the "Lifestyle Center" - outdoor centers that are shopping centers but much more. They include resultants, nightlife, gathering areas, sports, and are all pet friendly. The Village at Westfield Topanga is the latest to open in California in the San Fernando Valley of Los Angeles. 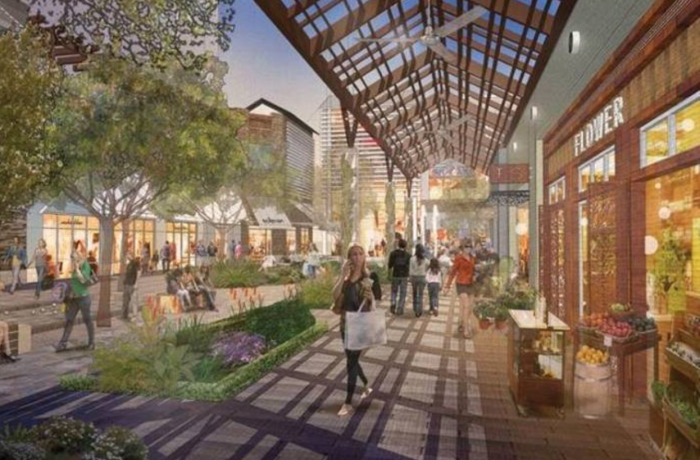 The company behind it Westfield Corp., says The Village complex will e merge as one of the top retail districts in the United States, Westfield said. The opening was quite something on September 17, done to perfection to give a taste of all that they offer. When completely finished, the $350-million complex will offer 300 outlets. Right now there are about 80 retailers and 17 restaurants in Warner Center as Westfield Corp., the developer and owner. The place is stunning and a great destination for shopping, eating and chit chatting with friends. There is nothing like it in the San Fernando Valley. The entire property is outdoors (it’s not an indoor mall) and it is filled with great eateries and restaurants, gorgeous landscaping, fire pits, water features, a bocce ball court, lifestyle stores and street retailers such as Nathan Turner’s American Style, Fleurish floral shop where you can make your own bouquets and take classes, Bitter Root pottery (which is open 24 hrs) and in which you can take classes or throw your own designs on a pottery wheel, one stop beauty with Blushington, DryBar, Nail Garden and Skin Laundry- plus a 24 hour fitness, YogaWorks, FlyWheel and Burke Williams Spa. 20 million visitors are executed to visit annually and generate in excess of $1.3 billion in sales each year. Built on 30 acres, there is parking in a 2,500-space structure, which is free for the first hour and $1 an hour that. If you come to L.A and happen to be staying in the valley, its a definite must and even if you're not, it's still a place to see as this is a lifestyle center experience that has a fresh take.